There is no shade along this trail so wear sunscreen. You can burn even in the winter months on a clear Florida day. 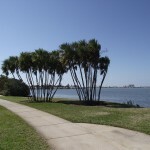 I began my ride at Weaver Park in Dunedin. 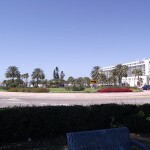 From U.S. Highway 19 (approaching from the north or south), head west on Main street (County Road 580) toward the Gulf of Mexico. 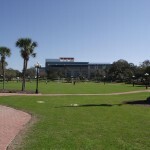 Around Bass Boulevard, Main Street will branch off and head toward the south and west. Stay on County Road 580 which becomes Skinner Boulevard. Where Skinner Boulevard intersects Broadway (County Road 595/Alternate Highway 19), head north on Broadway. 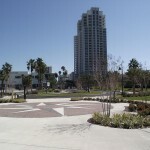 Weaver Park will be on your left – there is parking on either side of Alt. 19. 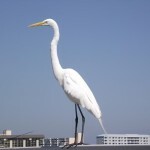 15.88 Miles – From Weaver Park parking on the west side of Alternate Highway 19 south through Dunedin through north Clearwater. 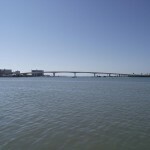 Through downtown Clearwater to the Clearwater Memorial Causeway Bridge. 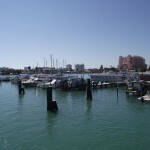 Out to Clearwater Beach and heading back to the point of origin. Check out the links and gallery pictures below. 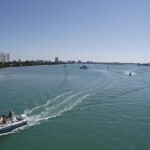 If you like being near the water, you will love this ride. 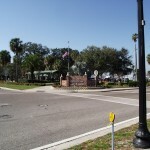 It starts at JC Weaver Park just north of downtown Dunedin. 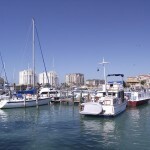 You head south to the Dunedin Marina with its fine views of Old Clearwater Bay. 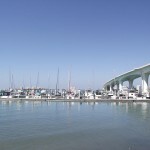 Continuing south, you will meander between the shores of Old Clearwater Bay to your west and Edgewater Drive to your east. 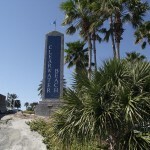 Once you cross the bridge at the southern terminus of the Edgewater Trail, Edgewater Drive becomes North Fort Harrison Avenue and you have entered the city of Clearwater. 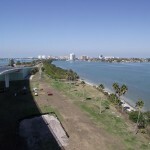 Continue south along Fort Harrison (you will be sharing the roadway with automobiles) and head west on Seminole Street. 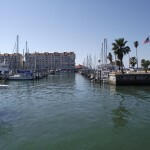 If you want to make a small detour, there is a marina in the process of being renovated at the western end of Seminole Street. Head south on North Osceola Avenue, west on Jones Street and then south where Osceola Avenue picks up again. From there, head west on Drew Street which curves to the south to follow the waterfront. 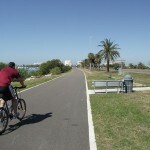 There is a trail that runs parallel to Drew Street and crosses under the Clearwater Memorial Causeway bridge. 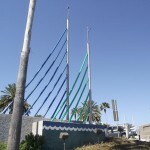 You will see a spiral ramp that leads up to the Clearwater Memorial Causeway Bridge. 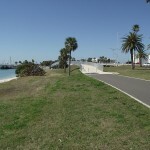 A pedestrian/bike trail parallels the bridge on both sides. I would suggest the side connected to the spiral ramp. 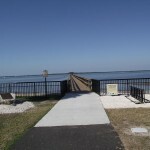 At certain times of year (spring break comes to mind), it is almost impossible to cross the Causeway. 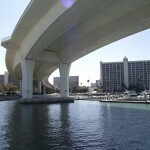 So, the spiral ramp keeps you from the headache of later having to cross congested Clearwater Memorial Causeway. 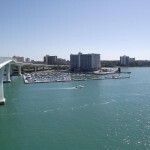 Be sure to stop at the top of the bridge to see the fine views of the intercoastal and downtown Clearwater. 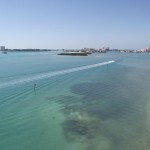 It is an easy ride out to Clearwater Beach from the top of the Causeway Bridge. 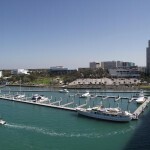 There are plenty of things to see and do in Clearwater Beach. Check out the link below for more information. This route features sections where there is no designated trail. You will be sharing the road with other vehicles. 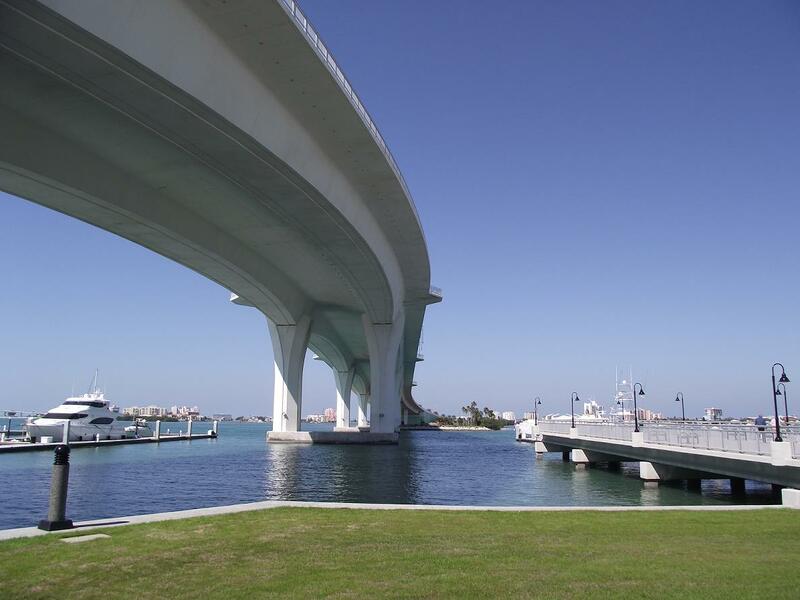 If you aren’t in the greatest shape, the climb up the Clearwater Memorial Causeway Bridge could be taxing. 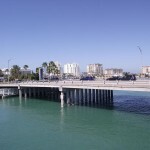 The congestion of foot traffic and, traffic in general, around Clearwater Beach. 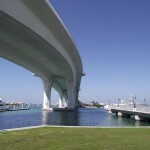 The Clearwater Memorial Causeway Bridge – my love for bridges continues!